Stay at Kalaloch beach for stunning views of Pacific surf and seastacks. When best-selling author Stephenie Meyer needed a locale to set her Twilight novels, she chose Forks, Washington, right next to Olympic National Park. Meyer chose well. Not only is Forks and the nearby park famed for their rains and gray skies―useful for the sun-shunning vampires of Twilight―all of Olympic National Park possesses a dreamy, otherworldly quality. Here are some of the densest temperate rain forests in the world, with some of the biggest trees and unique plant and animal species. Here are waterfalls splashing through moss-softened gorges. Here are 7,000 foot mountains and some sixty named glaciers. And here are long, gorgeously empty beaches where the Pacific tosses immense wave-carved chunks of driftwood onto the bare sands like children’s toys. Olympic’s 1,441 square miles occupy much of the Olympic Peninsula, due west from Seattle. The park is basically divided in two. Its largest portion lies inland, centered around the Olympic Mountains. Separate and to the west is the park’s coastal section, some 70 miles of beaches with names both romantic (Ruby) and matter-of-fact (Beach 1, Beach 2, and so on). Both sections are home to an impressive array of wildlife: seals and sea lions and whales in the waters along the coast, black bears, mountain goats and Roosevelt Elk in the forests and mountains inland. 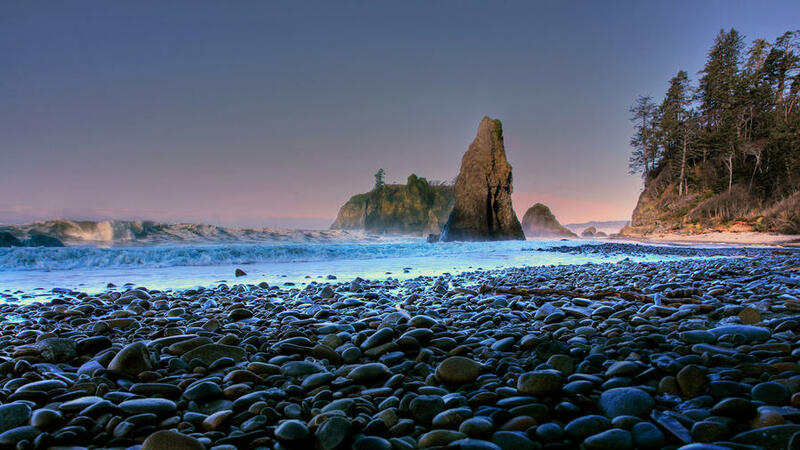 Olympic National Park is three hours west of and across Puget Sound from Seattle. It’s accessible via ferry from Port Townsend, WA or via U.S. 101 from Olympia, WA. Olympic’s extremes―the Hoh Rain Forest’s annual up-to-12-feet of rain, Hurricane Ridge’s fierce winter winds―can make it seem an intimidating place to visit. But summers are beautiful here, with highs in the 60s and 70s and frequent sun. Waterfalls are at their ferocious best in spring and early summer, but rain can dampen spirits. July and August bring drier days—and crowds. Late summer is the least rainy time to visit Olympic National Park. Drive up to 5,242-foot Hurricane Ridge, the easiest way to reach the heart of the mountains; from there, hike half-mile-long High Ridge for parkwide views. Then hit the coast (a three-hour drive from Hurricane Ridge) and beachcomb among towering sea stacks at Second Beach. Although 95 percent of the park is wilderness, most of its highlights are easily reached via U.S. 101, which circumnavigates the park. There’s good camping, spectacular drives, and family friendly trails. There are even a couple of first-class resorts: Kalaloch Lodge on the coast, and Lake Quinault Lodge, on Lake Quinault just south of the park. If time is limited, focus on one area: Hoh Rain Forest, Kalaloch, and Lake Quinault are great choices. Olympic National Park is far too beautiful, and way too much fun, to be left only to vampires. Hurricane Ridge is least congested before 10 a.m. and after 5 p.m. (also the best time to snap photos and, often, to spot wildlife). If the Hoh Rain Forest is overrun, try the Quinault Rain Forest or The Queets, which is about two hours south. For crowd-free beach time, pick one (like Second Beach) that requires a short walk or hike.